For this week’s blog, I’ve been asked to give an overview about my time on the Bridge programme, through Animation Skillnet, to photo-realistic modelling and everything in-between. I knew this would not be a paid position, but was determined to get the experience in a VFX studio to learn the pipeline while working, so I made the move from Belfast to Dublin. When I arrived on my first day, I was introduced to the team and also another participant on the Bridge programme, Bas. I will breakdown some of the the projects I got to work on below. 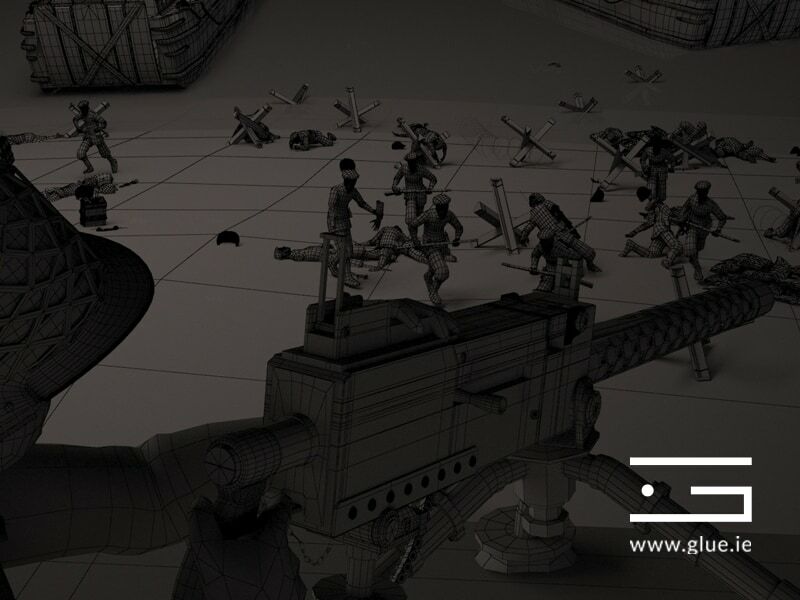 Ray explained that the first project we would be working on would be set in the second world war and involved a crowd simulation animation and several assets would need to be modelled. My background is actually in Maya for modelling, though GLUE mainly uses 3DS Max, so I spent the first week familiarising myself with 3DS Max, using tutorials before starting the modelling. It was great to learn how the pipeline worked, sometimes more than one project was being worked on at any one time. 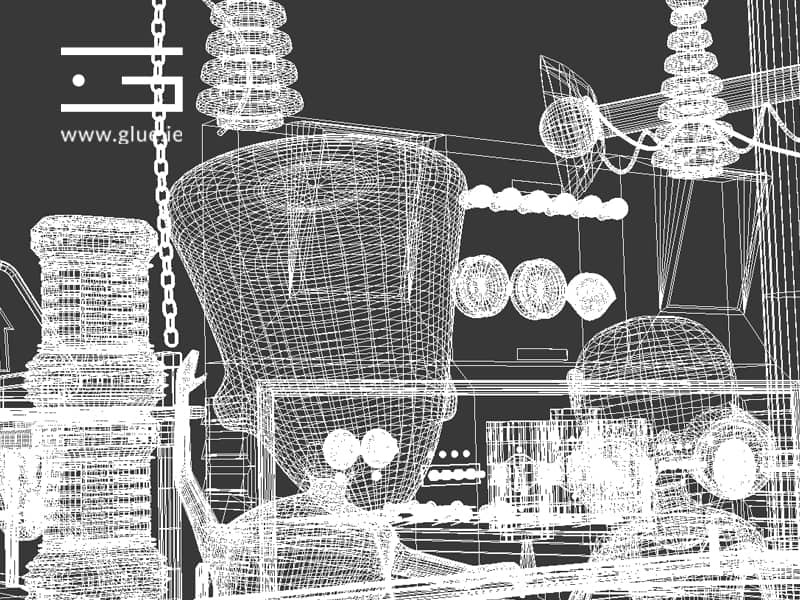 While Bas and myself would model the assets, the animators were already working on animations for the characters. The first thing I modelled was the bunker to add to the scene, reference had already been gathered before I started so it was easy to begin modelling. I found estimating my time frame for modelling something I could do based on demand for the project and our production manager would check in daily to see how we were getting on. I took on the task of preparing to model the machine gun and radio backpack. Something I never thought I would say coming from a Maya background, I quickly took to 3DS Max and found it to be faster for modelling! The first thing I learned in the production pipeline is the importance of proper reference. Researching and gathering as much reference as possible is essential to creating accurate and realistic models. I found schematics and blueprint images for the gun which was a bonus as I could get exact measurements and detail. The backpack was a bit more tricky so I had to work from photos, there was still enough content to create accuracy. You can see the process and breakdown of the crowd simulation on our blog page here. Once that project was near completion, we were briefed on another involving modular city building. This is something I’ve always wanted to learn because it’s a quick way to build environments and is commonly used in making games. This was great fun and a small team of us spent a day gathering reference photos of buildings around Dublin city. We would take these photos to work on texture sheets which could be used for each modular asset. These allowed for accurate and unique textures. The full breakdown on this process can be found here. The next project we were briefed on was a LEGO project for Halloween, GLUE had worked on a LEGO Eurovision project before and I was really excited to start working on this (thinking of the LEGO movie!). Fortunately we already had character assets and some pieces we could re-use. The key for this project was to ensure that we maintained LEGO accuracy so anything that could not be pieced together from previous assets had to be modelled new and look like real LEGO pieces. 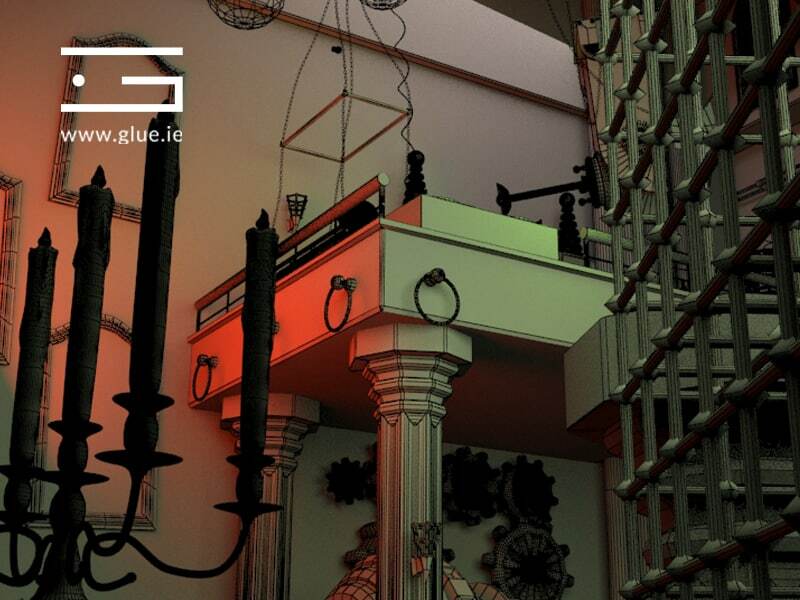 We broke the scene into two parts, I worked on the interior scene and another modeller did the outside. This was fun to reference and research because it involved using actual LEGO to check what types of blocks we could find that would match a particular set piece. It allowed us to determine what we needed to model for the scene and to even build the scene ourselves using those pieces. I really enjoyed working on this project and it was like building a LEGO castle, only digitally. While this project was underway, we had the opportunity for some Zbrush and character modelling training with Anthony Callaghan provided by Animation Skillnet. I already knew some Zbrush, but not much about the workflow of moving between Zbrush and a modelling package such as 3DS Max. Anthony also covered topology and modelling a realistic character, which was really interesting and particle effects using the slate editor in 3DS Max. Particle systems are something that I’ve always wanted to learn and I used what I learned in the next project we worked on in GLUE for our own Halloween animation. We were quite proud of what we had achieved with the LEGO animation and the GLUE team wanted to make our own animation for Halloween by designing our own characters and story of an evil scientist’s lair. I set about doing some concept art for the scene, while working with our art director Dom who was making some character concept drawings. Once we agreed on a concept, I started blocking out the scene with basic shapes in 3DS Max and gradually building it up. GLUE’s concept artist had many designs, we then voted on which art style was the best and most suitable for our needs and while this was ongoing, I was modelling the scene and our animators were researching what style would work for our characters from classic monster movies. I really enjoyed working on this project as I learned how to use new techniques in 3DS Max and VFX which I had barely touched on, such as particles and cloth simulation. If you want to see the full animation or breakdown process please check out our blog here. After finishing our animation we had some breathing room, so Ray took time to show us some After Effects projects and the process of tracking and using After Effects. I had touched on camera tracking before during my time at Escape studio’s so I was interested in knowing more about what tools GLUE used for their work. 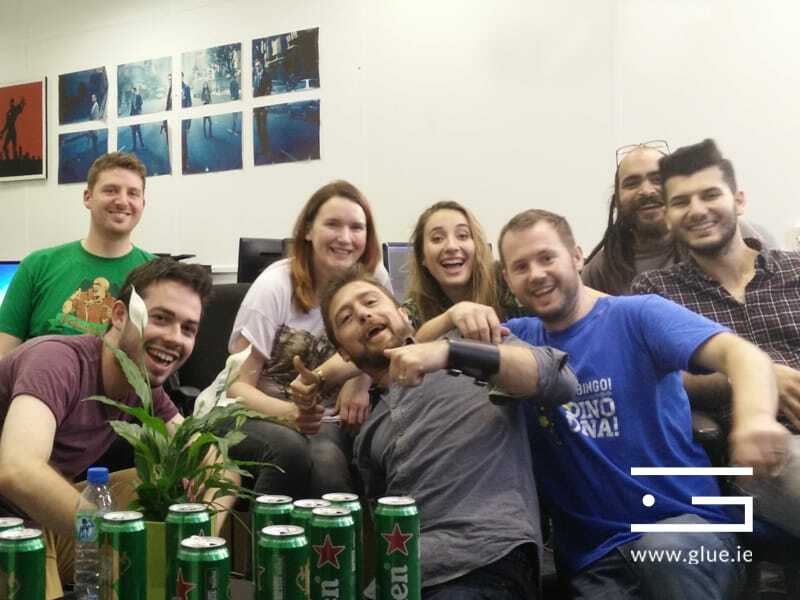 At this time some other members of the team finished their internships and we said our goodbyes with some celebratory drinks. I was due to finish my internship, but decided to stay and gain further work experience a few days each week. A new project had been green lit for an oil refinery in the Middle East, which will be a separate blog altogether. Often concepts need to be modelled, as I said before reference is extremely important but not always available. This meant some projects have a different and possibly more challenging tasks for us as a team because we had limited reference and would only have some AutoCad blueprints to work with for layouts that we would model and bring to life. Working in this fashion has really taught me that it’s possible to model without clear reference, although it is a challenge and it’s not something I would have thought possible starting out in my 3D modelling career. Working at GLUE was a great opportunity and I’m very pleased with the progress I made, especially picking up and learning new tools I never thought I would use – such as 3DS Max. I’d like to thank Animation Skillnet for providing this opportunity and GLUE for taking me on board as it has been an invaluable experience.